The festivities to commemorate Hillcrest Jewish Center Day Camp’s fiftieth summer of camping began on January 19, 2008 when Hillcrest hosted a “Camp Shabbat.” Many former campers and counselors attended to celebrate the special occasion. After the Torah service, current director Howard Seidman was awarded a plaque from Hillcrest in honor of the fiftieth anniversary. A special presentation was also made to Bert Rosenberg, who was unfortunately in the hospital and unable to attend. Former Assistant Director Jeremy Bernstein accepted his plaque and gave a speech in his honor. A luncheon was held following services in honor of the camp’s rich history. On the first day of Hillcrest 2008, campers were surprised by a special treat - a cake commemorating the camp’s golden anniversary. When it came time for Color War, many were surprised that instead of being on the Blue or White team, they were on Yellow or Green - the original colors of Hillcrest JC Day Camp. 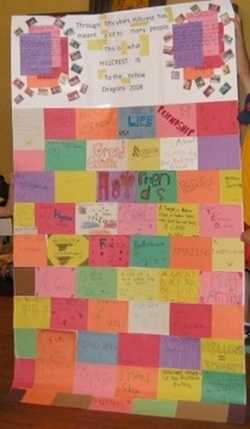 Pictured to the left is the Yellow Dragons’ banner - a “patchwork quilt” in which each camper and staff member on the team created a square depicting what Hillcrest meant to them. Atop the banner are photos spanning the 50 years of HJCDC. As the summer came to a close, each group was asked to contribute one item to a time capsule that was to be buried in Hillcrest’s backyard play area. Included in the time capsule were a pool bubble, old Color War songs and cheers, trip calendars, Howie Seidman’s desk nameplate, and more. The entire camp came together to bury the capsule, with each camper and staff member having the opportunity to shovel dirt atop the capsule until it was completely buried. 3 - It’s a great place to be a kid! 2 - The memories last a lifetime. 1 - The friendships last forever.